Have you ever heard of a place called Keukenhof Gardens? Well, basically, it’s a world famous botanical park on the outskirts of Amsterdam, and everybody goes berserk for it. It only opens for a couple months each spring and treats all who grace its grounds to a sprawling bouquet of the most creative and colorful tulip displays they’ve ever seen in their lives. In fact, most who visit the gardens spend the rest of their living days engaged in a fruitless attempt to recapture just a hint of the magic that the fanciful flowers of Keukenhof brought to them. Or at least that’s what I’ve heard. I wouldn’t have the slightest clue, though, because I’ve never been to the place. We tried really hard to go there though this year, but it all went wrong. As a result, I don’t have a flowery report featuring tales of skipping around smelling tulips or walking across a lake on pretty little pedestal stepping stones to share with you. I did come home from my attempted visit with some great tips for how not to visit Keukenhof Gardens from Amsterdam, so I hope that makes up for it. 1. Misread the website about the price of bus tickets to Keukenhof Gardens from Amsterdam. There is no better way to not visit Keukenhof Gardens than to begin things with a fundamental misunderstanding of how much a trip will cost. Everything pretty much flows from this. 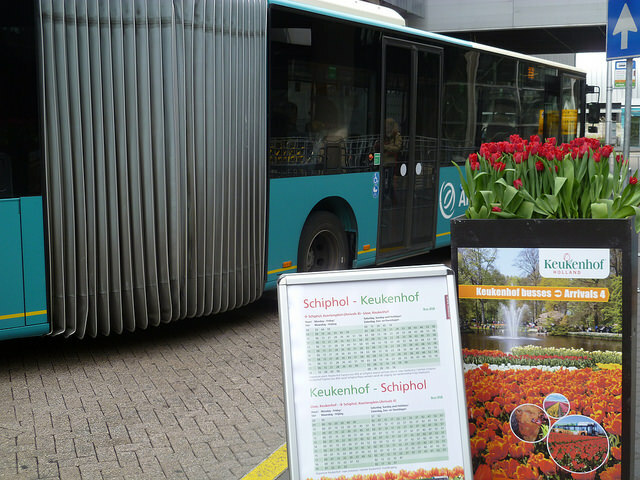 After quickly scanning Keukenhof Gardens’ website, make sure to fall under the mistaken impression that a combination bus ride from Amsterdam/admission ticket called a ‘combi’ will only cost €23.50 per person. Remind yourself that while 40-plus Euros does seem like a big chunk of change for two people to look at flowers, it’s Keukenhof Gardens, baby, and sometimes you simply have to splurge. 2. When the bus driver tells you there are no ‘combi’ tickets to Keukenhof Gardens from Amsterdam, go ahead and board that bad boy anyway. 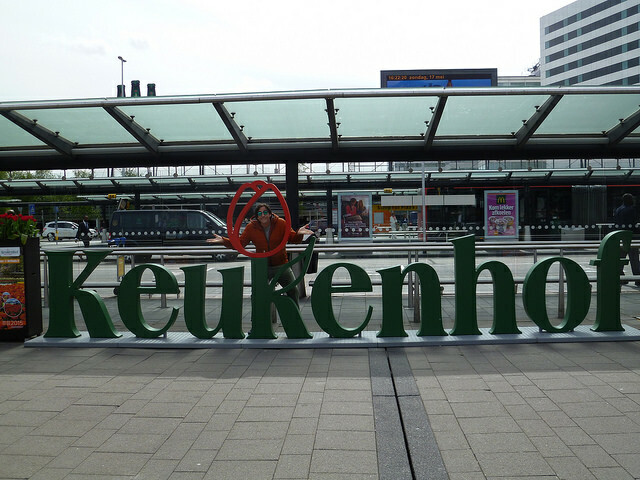 This is a crucial tip for not visiting Keukenhof Gardens. When you step on the bus in Amsterdam and are told point blank that “there are no combi tickets to Keukenhof Gardens from Amsterdam”, continue your journey undeterred. Convince yourself that since the airport is an intermediate stop, somehow everything will be straightened out there by someone more informed than this clearly clueless driver. A delusion involving the €10 you have just paid somehow being credited towards the combi ticket worked well for me. 3. 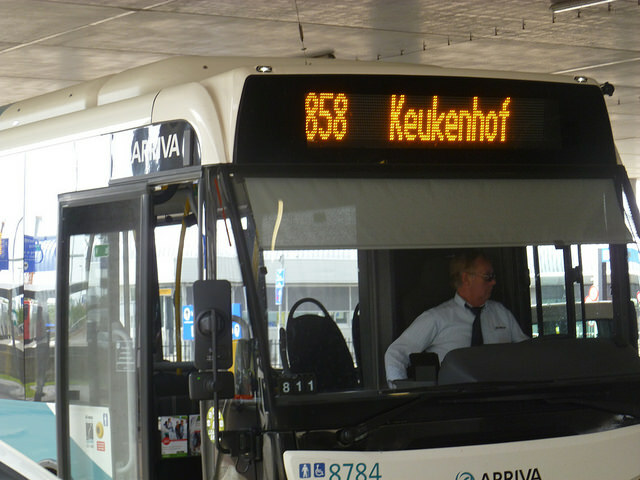 Once at Schiphol International Airport, discover the true details of this elusive combi ticket. This is where not visiting Keukenhof really starts to take off. At Schiphol International Airport, information is widely available that plainly explains that the €23.50 combi ticket is only good from the airport to the gardens, not from Amsterdam. This is when I recommend doing some quick math in your head to figure out that since you just forked over €10 to the bus driver for a trip to the airport, the return trip plus combi tickets will now cost you €67. Yep, €67 for two people to take in some tulips. Feel free to smack your head repeatedly. 4. Lurk around the airport for a while. 5. Head home €20 lighter. Scrape up the scraps you have left of your pride, push past The Runway Buffet and its deliciously decomposing pizza with your tail between your legs, and then buy bus tickets back to Amsterdam. Before you leave though, pose for a picture with a big promotional Keukenhof sign they have set up and try to convince yourself that you’ve had a character-building experience.